Ketchikan is located in the heart of Alaska and is accessible only by air and by sea (Alaska Marine ferries, BC Ferries & by cruise ships). Because there are no roads into or out of Ketchikan, travel by ferries is the major form of transportation & must be booked well in advance. 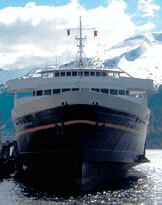 Ketchikan Alaska is served year-round by ferry service from 13 ports.